floss | What's in a Smile? You are currently browsing the category archive for the ‘floss’ category. Found this floss resource, Focus on Floss, a desciption of all kinds of floss, as part of my research for a post I did on my other blog, about Everyday Sustainable floss. The brief take on it. ROUTINE makes it happen everyday, which makes it everyday sustainable. As much as I advocate for healthy materials, whatever solution increases the chances that you’ll floss everyday, is the best everyday sustainable solution for you. We all know flossing is good for us. I have to thank my year in braces for my new everyday ritual: flossing. It has definitely become a habit. Which means I use a lot more floss than I ever have in my life. How to keep flossing at a max, while minimizing waste? I recommend this economy-size floss I found at Walgreen’s: Crest Glide Floss, Original, 109.4 yards (100 meters). I don’t know how buying and using one of these compares with buying and using two regular type flosses (that have half the amount of floss), but it seems like at least there’s less packaging and shipping of only one versus two items. When I’ve used up the floss, I’ll try to repurpose the cylindrical container in some way. It looks more promising than the regular containers. DISCLAIMER: Someone had posted a comment about these earlier, so I followed up and they sent me three samples. I don’t have anything else to gain from them, and don’t in any way feel obligated to give anything but my most honest evaluation of the product. What I first noticed and liked was that the “floss”–which is made of thin stainless steel, according the company info–is really thin. I had NO problem sliding it between my teeth, like I do with regular floss. Nice. There is the fear that I’m going to slice my gums because the thing looks sharp, but actually no problem there. What I don’t like is that I couldn’t quite navigate the flosser around the tooth like I can when I’m using regular floss. Maybe I’ll get the hang of angling it. The product literature features that you can use it with one hand, and this is quite nice. Really is a one-handed flosser. I have a question about how hygienic it is if you stick it back in the holder; I guess I’ll pay attention and make sure to clean and dry with extra special care once in a while. Not sure how to evaluate it in terms of waste-stream; the product is small and packaging minimal, too, but is it less waste than using regular floss? Can I throw it in plastic recycle? The flyer they included in the package showed a photo of use with braces. I can’t comment on this with experience, since I no longer wear braces, but I imagine it might be useful in a pinch. Anyone given it a try? I don’t think I’ll replace my regular floss for daily usage because of the nooks & crannies that I think floss address better. However, I’ll carry this around in my wallet. A lot less work when I’m out at a restaurant or a meeting, than trying to floss. Especially if I don’t think I can wash my hands adequately to use the floss. You can purchase here or get three free but pay $4.95 shipping/handling. I was traveling in Japan last month and ran out of floss. “No problem,” I thought. “I’m sure I can find some at an omnipresent convenient store.” But that was not the case! The only floss I could find was imported floss from the US for about $6.50, or the individually-packaged dental flossers. You know, those little plastic things with a little bit of floss across it that are disposable. What a waste of extra materials. Sure, less floss was used each time, but the packaging and the plastic that would be wasted with each use was not something I wanted to sign up for. I wasn’t sure how easy it would be to use. Would the floss slide between my tightly-aligned teeth? In the end, I bought them because I had no other choice. How did it go? As feared, it was tough going between my tightly-aligned teeth, but I managed to get them through my teeth. And since I floss regularly, I didn’t have any bleeding or discomfort. It was a little difficult getting at the back teeth at first, but I got the hang of it. One advantage was getting some leverage in flossing between the back teeth. In the end, better to floss with a sub-optimal tool, than not at all. Of course, with braces, this option would NOT WORK AT ALL. So this is about the POST braces life. Which, remember, is just as important for beautiful teeth and health. Fortunately, I’m back in the US and with my regular rolls of floss. That said, I know that some people love these flossers, so some thoughts on the options, with an eye to sustainability from a materials perspective. Decrease waste by going with the multipacks; no individual wrapping. Like these from Plackers and GUM. Minimize waste by using a flosser with a disposable head; you keep the handle. Like the Reach Access Flosser. Go one step further to minimizing plastic waste by getting a floss holder, where you put your own floss in the holder. This would be a great option for people who like using these flossers, but want to cut down on plastic waste and cost, or like me, would rather use my own floss which fits better between my teeth. Here’s one from Flossaid. There’s no way around it. Flossing with braces is a pain. It’s a chore. It’s not fun. But I gotta do it. The stiffer the floss the better; that way it goes where you point it. So use stiff floss. Of the two flosses that I’ve reviewed, Desert Essence Dental Tape and Tom’s of Maine Natural Antiplaque Flat Floss, I recommend Desert Essence. Keep your floss as dry as possible. The wetter it gets, the limper it gets. Unfortunately, at the very back top molars, the angle makes it impossible for me to thread the floss under the archwire without the threader. I’m resigned to this, though sometimes I skimp and skip it. Do as I say, not as I do! I’ve never flossed as much as I have since getting my braces; this is no doubt a boon to my dental health… as long as I keep it up after I get the braces off, too. Which will be in 5 months! I’m due for a month 7 report tomorrow! This is one of several reviews of healthy option products for this braces adventure. Read others on the Healthy Options. Background: I’ve been using Desert Essence Dental Tape (which I reviewed here) and was happy with it. However, when I finished it, I decided to try a more readily-available option since I didn’t want to have to wait until I got to Rainbow Grocery or Elephant Pharmacy. The filament. Looks like the options are primarily plastic (PTFE or teflon, or polyethethelene), nylon (Tom’s of Maine’s floss) and natural fibers. The only natural fiber I’ve been able to find in my brief research is silk, from Radius. I wrote to Tom’s to learn about the nylon material. I was told that it’s stronger than teflon (which is used in other products), but didn’t get an answer about it’s healthfulness. That same customer service person said that it’s a better floss because it doesn’t fray. I disagree. Since I’ve been threading it under my braces, it’s easier to notice the fraying at the end of the floss, and it also frays when the floss gets caught on a bracket. But, I can’t stand to waste anything, and this Tom’s floss IS usable, so I’ll finish up the box. AND, it’s available at Walgreen’s, so it’s easy to find in a pinch. This is my first installment of reviews of healthy option products for this braces adventure. I’m listing these on the Healthy Options page as well. Background: I’ve been using Crest Glide or some similar “tape”-style floss, because it’s easier to use and doesn’t shred between my tightly-aligned teeth. The filament. Looks like the options are primarily plastic (PTFE or teflon, or polyethethelene), nylon (Tom’s of Maine’s floss) and natural fibers. The only natural fiber I’ve been able to find in my brief research is silk, from Radius. I’m still looking for info on relative health safety. The toxicity of teflon on cooking pans has been tested, but hopefully your mouth won’t get that hot for that long. 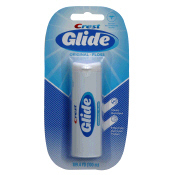 It’s not as smooth and silky as the Crest Glide, but it definitely works for my tight (and sore) teeth. It’s an acceptable alternative. I’m researching the filament and wax on this product. Who’s smiling in the header photo? A friendly schoolgirl and me, in Guanajuato, Mexico.